This Anchor Line trade catalog, Anchor Line of United States Mail Steamships, describes some of the tours available in 1897. Henderson Brothers, located in New York and Chicago, were the General Agents. 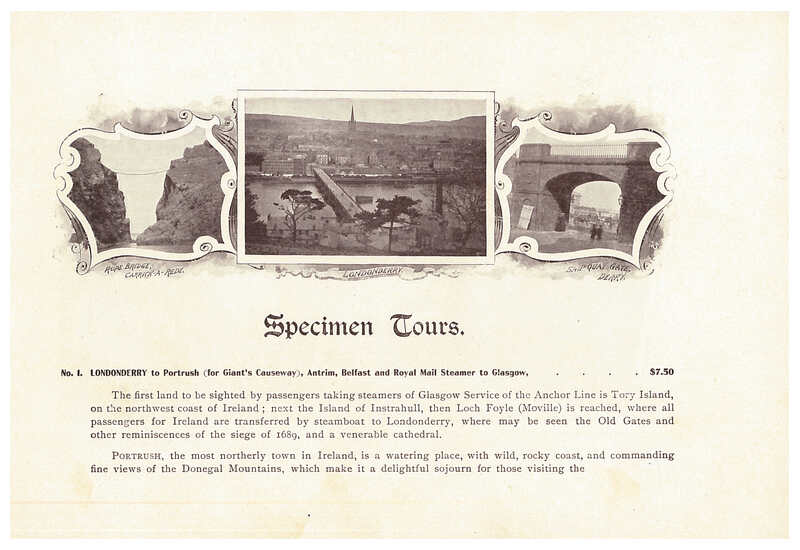 The first few tours described in this catalog began in Ireland. Anchor Line, Anchor Line of United States Mail Steamships, 1897, title page showing Anchor Line steamship. 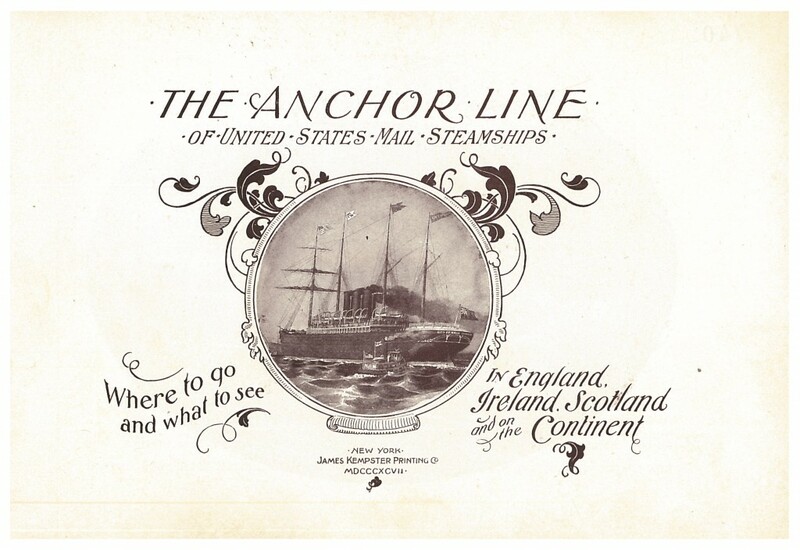 Anchor Line, Anchor Line of United States Mail Steamships, 1897, Anchor Line Services. Click to enlarge. 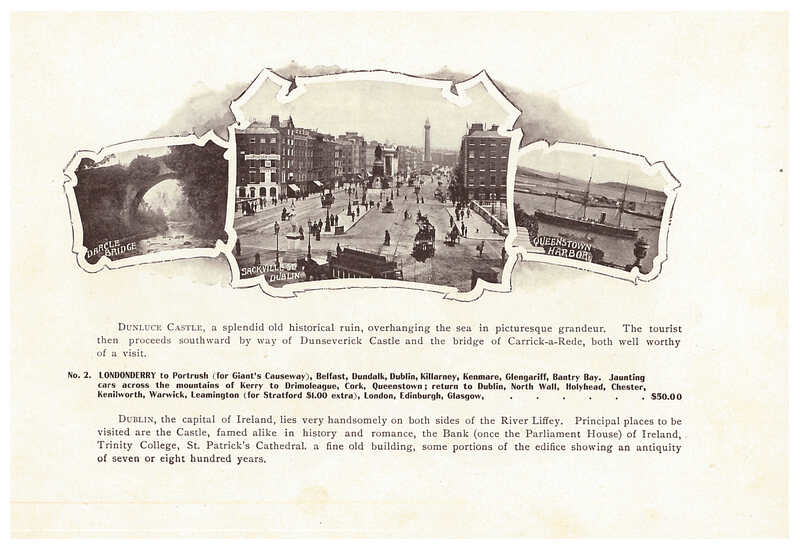 Arriving at Loch Foyle (Moville), passengers bound for Ireland transferred to a steamboat and continued their journey on to Londonderry. Several tours began in Londonderry. Anchor Line, Anchor Line of United States Mail Steamships, 1897, Rope Bridge, Carrick-A-Rede ; Londonderry ; Ship Quay Gate, Derry. Click to enlarge. Anchor Line, Anchor Line of United States Mail Steamships, 1897, Dunluce Castle and Giant’s Causeway. Click to enlarge. Anchor Line, Anchor Line of United States Mail Steamships, 1897, Darcle Bridge ; Sackville St., Dublin ; Queenstown Harbor ; Specimen Tour No. 2 itinerary. Click to enlarge. 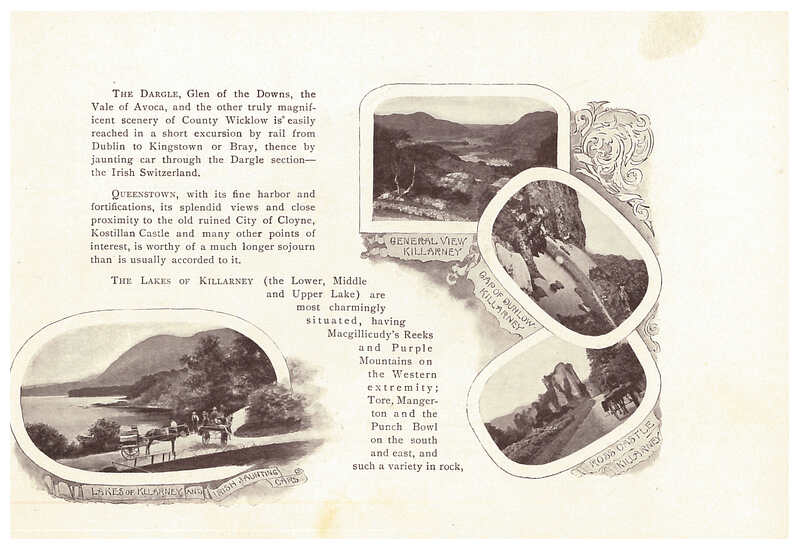 Anchor Line, Anchor Line of United States Mail Steamships, 1897, Lakes of Killarney, Gap of Dunlow, and Ross Castle. Click to enlarge. 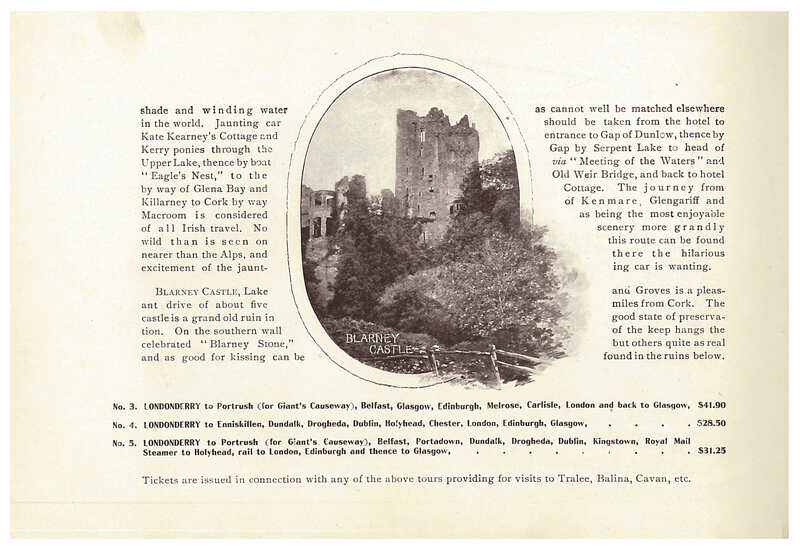 Anchor Line, Anchor Line of United States Mail Steamships, 1897, Blarney Castle. Click to enlarge. 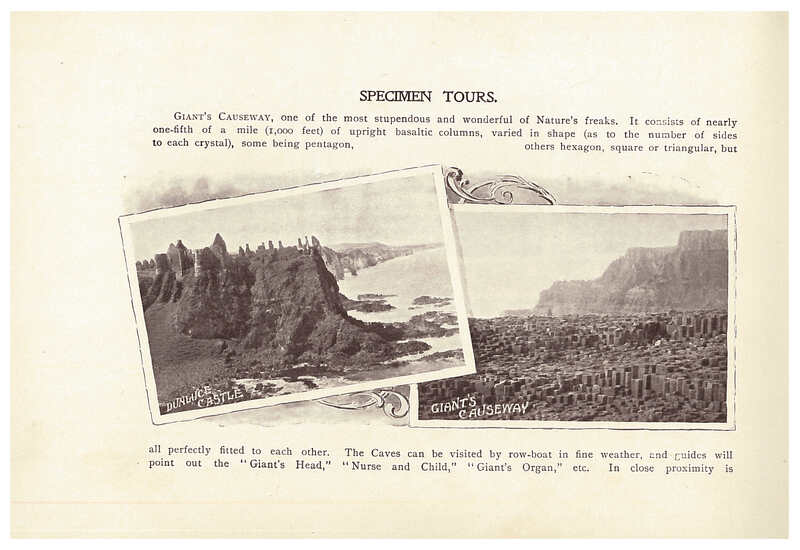 These are just a few highlights form the Irish portion of the tour described in this 1897 Anchor Line trade catalog. After Ireland, the group continued on to England and Scotland. 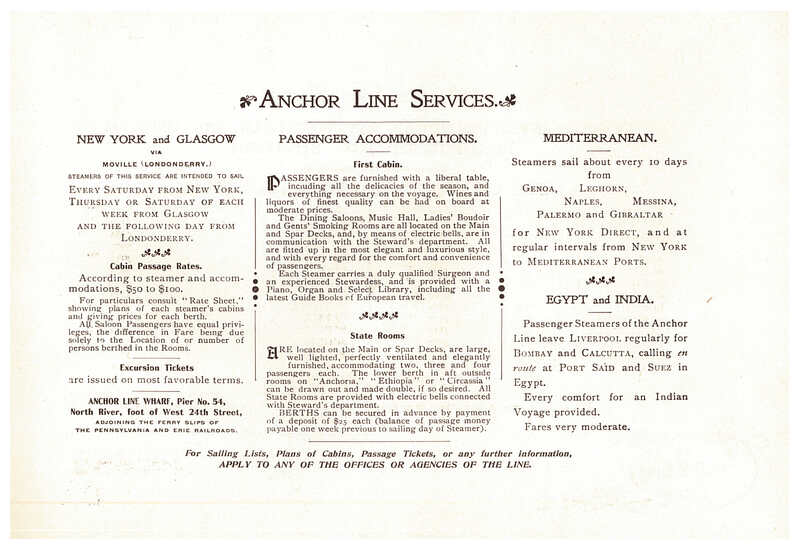 Anchor Line of United States Mail Steamships is located in the Trade Literature Collection at the National Museum of American History Library.